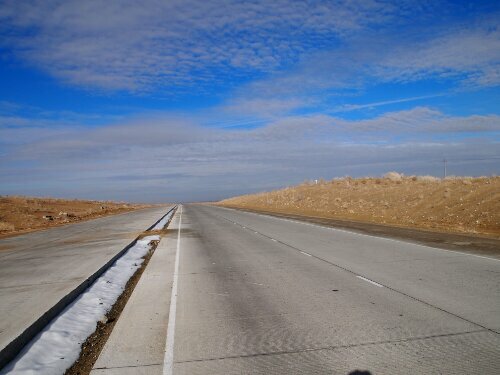 Riding into Nukus I made straight for the hotel I’d picked from the Lonely Planet: the Jipek Joli. It was a bit more than my budget but there wasn’t much choice in Nukus and I wanted somewhere nice after another few days in the desert. I was also going to spend a rest day here as I’d been riding for five days and my knees were feeling a bit creaky. 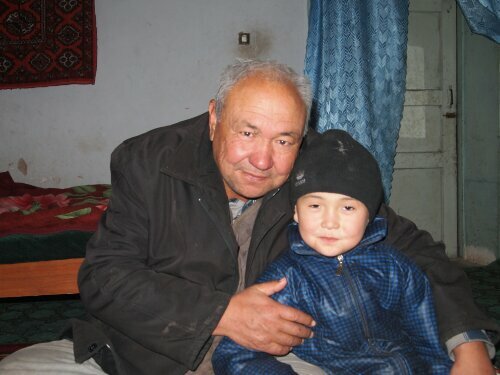 One day was definitely enough for Nukus, which while it lays claim to being the capital of the region of Karakalpakstan, an autonomous region of Uzbekistan, does not really have much going for it. The only sight seemed to be the Savitsky Museum, which is apparently quite famous. 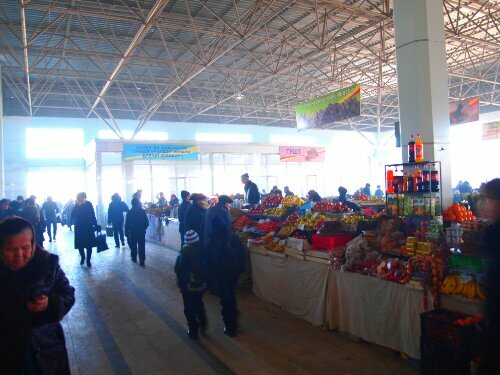 Apart from the museum the only thing there seemed to do in the city was have a look round the bazaar. This was quite interesting as it was pretty large and clearly the centre of life in the city. It was positively bustling. After the desert there seemed to be a lot on offer – I could buy fruit and nuts for instance. 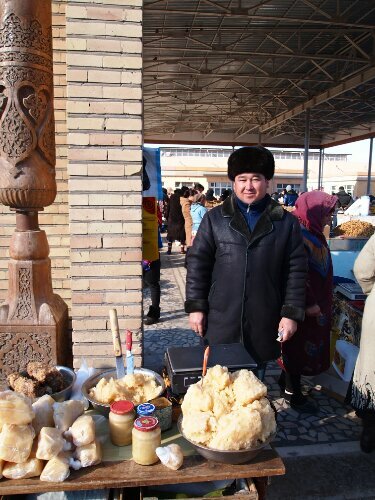 While in Nukus I also met some tourists for the first time in about two weeks which meant I got to have actual conversations. 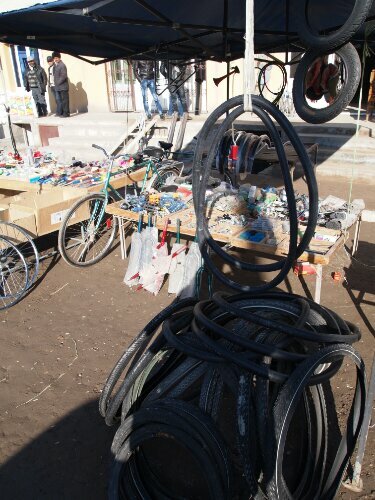 The only other thing of note I tried in Nukus was cleaning my bike. This turned out to be a mistake as it was so cold that as soon as I tried to wipe anything with water it froze. I managed to coat a rim of my front wheel with ice before realising…this meant I had basically coated one of my braking surfaces with a nice slippery layer of potential death! Luckily I stopped before I iced up the whole bike. 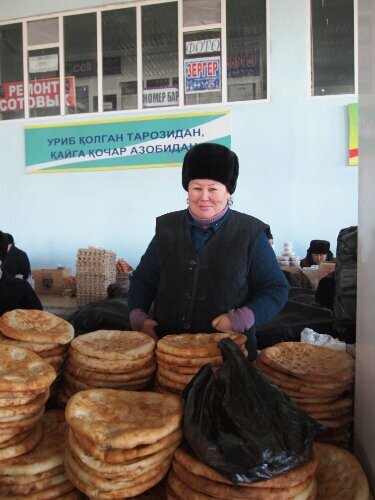 I left Nukus knowing I only had a couple of days riding till Khiva: my next destination. 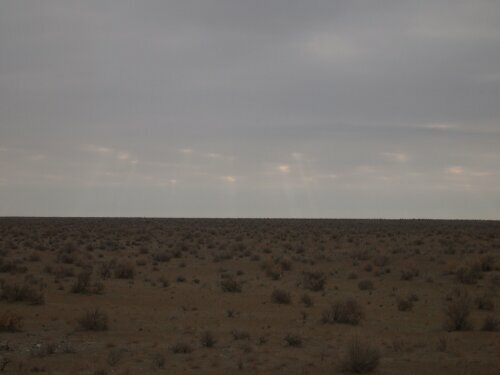 Worryingly as soon as I left Nukus I hit desert again…I thought that this was pretty unfair! Thankfully it only went on for a half a day and soon I was back amongst relative civilisation. 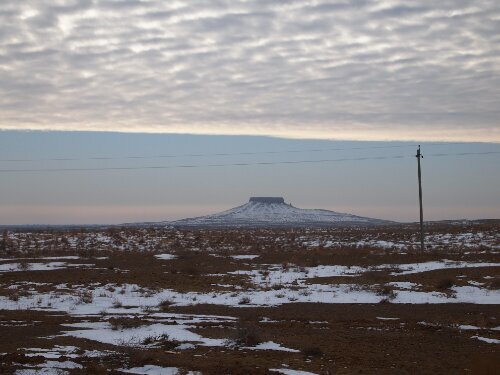 I also saw Chilpyq which is apparently a Zoroastrian tower of silence where the dead would be deposited so that vultures could pick their bones. Out of the desert there were mainly frozen fields and small farms to see. I also crossed a pontoon bridge across the Amu Darya river which was fairly nerve wracking as it didn’t look very well held together. I couldn’t get any photos of it as there were a few policeman around and they really don’t like their photos being taken. As usual when darkness began to encroach the decision as to where I was going to sleep that night reared its head. I was ready to camp from an equipment perspective if not from a psychological one. Also the whole area looked to be given over to agriculture, mud or ice, not ideal camping conditions. Luckily this region was inhabited and I decided to practice the skills I had learned from Rubina and ask someone if I could camp on their land. Seeing someone outside a farm doing something to some hay I attempted to ask him. He told me to follow and got his slightly more switched on looking brother who I then asked – the second brother then went and got their father who indicated I could sleep inside their house, he’d clearly decided camping was a crazy idea…I had to agree. The family were extremely kind and generous and this was even more striking given how poor they appeared. I felt guilty putting them to so much trouble. They had an intermittent electricity supply so got a car battery with some LEDs to provide light. They also fed me and lit their stove, which appeared to run on animal feed or somesuch so that I would be warm. The family was quite large with three generations living in the house, the women were not much evidence as their role seemed to be to set things up and take them down and disappear. This meant I only got to attempt to communicate with the men of the family, which while being very sexist probably saved the women from a lot of boredom! In the morning I was sent off with breakfast and what I assume were kind words. 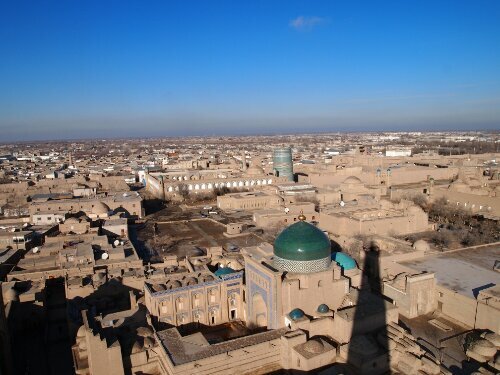 Next stop would be Khiva, the former capital of the desert khanate of Khorezm and the first genuine tourist city I had seen in a long time. Khiva is a mostly medieval walled city chock full of medressas, minarets and mausoleums all very well restored or kept up. It was very nice to walk around but was perhaps a little smaller than expected as I could make it across the whole of the Old City in about ten minutes. Also a lot of it was shut up as it was definitely the off season. Apparently in spring and summer there are tourists everywhere – in December it was mostly just me. As I walked past stall keepers I’d see their looks of hope turn to disappointment as they realised it was me swinging past again. 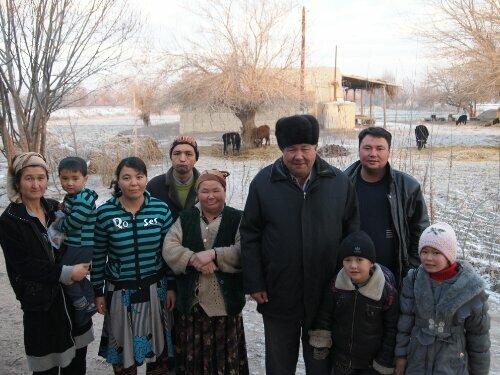 Tourists were so rare that Uzbek people kept stopping me to have photos taken with them. 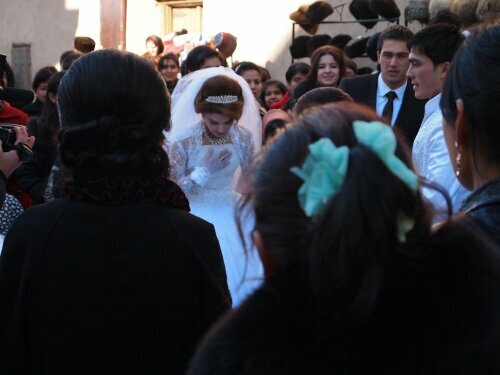 Very strangely it seemed that winter is wedding season in Uzbekistan. There must have been thirty to forty bridal groups promenading round the old city for photos and the wedding video while I was there. Every time two wedding parties met the brides had to bow to each other. I witnessed no fights over right of way. I also bought a seat cover from the bike stall. 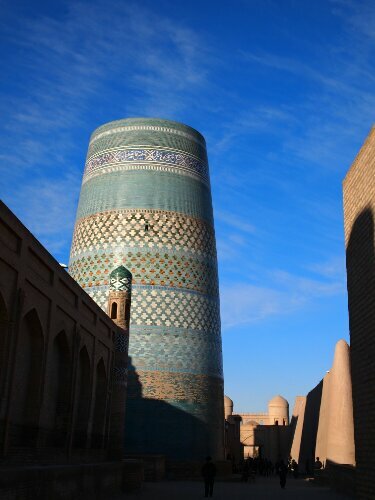 Khiva was an incredibly photogenic city and you can see more images of it in my Flickr stream, if I ever get round to updating it. 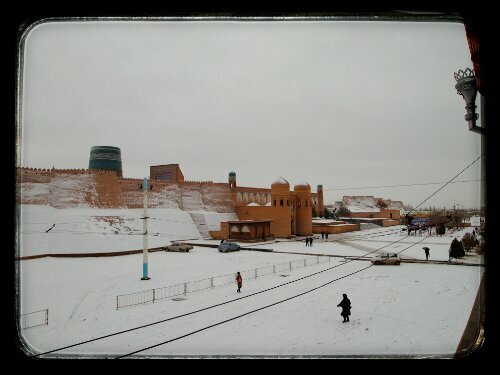 The day I was supposed to leave Khiva I woke to a couple of inches of snow. The family who ran the B&B I was staying at said you can’t ride in this, it’s cold and snowy. I initially thought I’d still try, then I stepped outside and realised that I’d actually like another day in the warmth curled up with my book. So I went back inside and changed out of my cycle gear and had a nice day doing nothing. 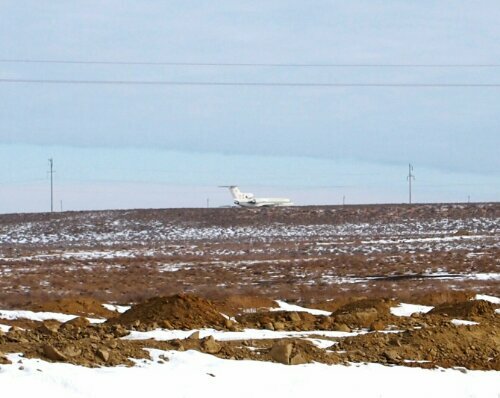 To be honest I was also a little bit nervous about heading to my next destination: Bukhara. 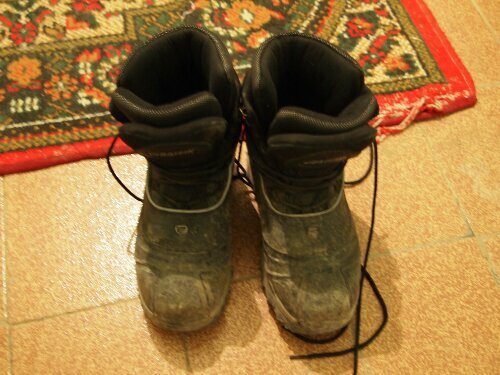 This was because I knew there would be another desert crossing to make, one with a minimum of three nights. I was not looking forward to being in the middle of nowhere again for three nights with no clear idea of where I would be staying. To top it off it would be Christmas Eve the next day and I would be spending the whole Christmas period in the desert. 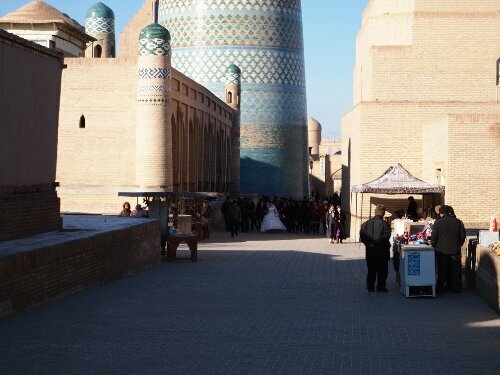 The next day I knew I had to leave, I couldn’t stay in Khiva for ever, especially as I only had about three weeks on my visa left. With a heavy heart I left and rode east again. Thankfully I knew I wouldn’t reach the desert until the afternoon and I had an uneventful first few hours riding. The only exciting thing was catching the slipstream of a truck transporting cotton which meant I got a lot more pace than I would have otherwise. Apart from that I rode and sowed confusion in cafes and shops where I visited as normal. 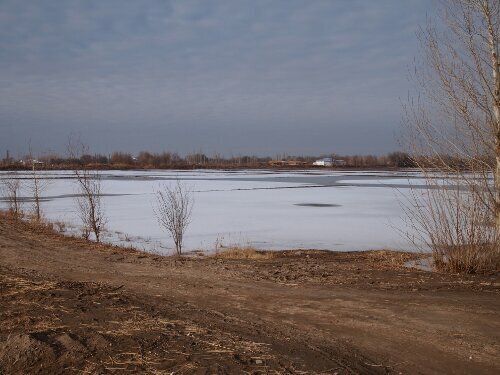 Then it was time to cross the Amu Darya river again and head back into the desert. There was another interesting river crossing as I went over on a combined rail and car bridge. Not combined in that there was a rail track and a road next to each other sharing the bridge but combined in that there was a road with rail tracks in it like a tram line, so it would have to be closed to cars if a train came. This bridge clearly didn’t get used much as I was taking a more direct route off the highway. Again no photos due to police presence. Heading back into the desert I rode wondering where to sleep. I’d read it was possible to sleep at cafes. 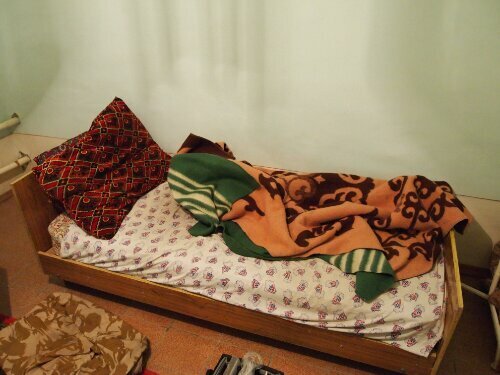 This was because in Uzbekistan people often eat or drink tea lying down at low tables; these areas double as sleeping places as the need arrives. As I rode I kept my eyes open not wanting to camp still. Then up ahead I saw some buildings – ‘hurrah’ I thought somewhere to sleep and just in the nick of time as sunset was fast approaching. As I rode up it became apparent that this wasn’t a cafe but rather a police check point which are all over the place in Uzbekistan. Before, when I had seen them I’d just smile, wave and carry on through. Annoyingly this time I was pulled over. They asked where I was from and where I was going. Then one officer started pointing at the bulges in my cycle jersey and asking what they were. One was my wallet, one was a bag of fruit and nuts, one was my hat and another a scarf. I generally have a lot of stuff stuck in my cycle jerseys as they have elasticated waists which will hold a lot – I also wear three of them to ride in the winter. Eventually he got to my money belt with my passport in it and asked to see it. This was given to another officer who went off to ‘register’ me. They then asked to look in my panniers but got bored quickly when they realised they were full of uninteresting stuff. 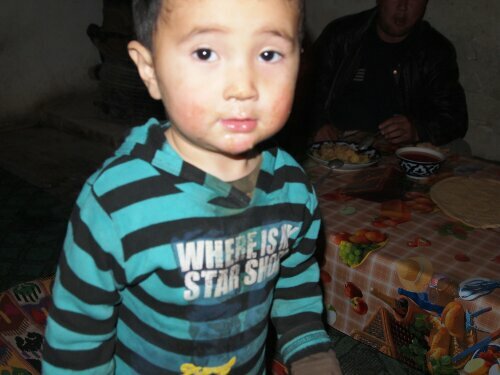 Then one goes ”photo camera’ and wants to see my camera, which I handed to him. A few questions followed on where some photos were but he again got bored as there are a lot of photos of endless desert. My passport was then brought back and I was told I should be careful as apparently there are wolves in the area – I was a little incredulous about this but asked if there was somewhere I could sleep. Then to my relief the policeman said sleep at the cafe just there. Happily just past the checkpoint there were three cafes in a row, all of which I visited before getting to the one that wasn’t being rebuilt or that closed in a couple of hours. The owner was fine about my staying there and I was happy to be spending Christmas eve somewhere warm, even if my meal consisted of dry bread and processed sausage. I also asked if the owner knew of any wolves by howling at him and pointing around the area. The owner said no and said the police were crazy when I said they had told me, which was reassuring. 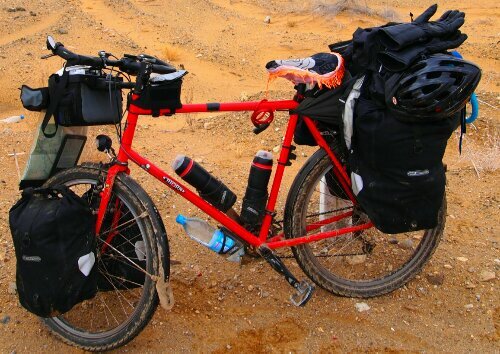 The next day I rode off again for another day in the desert, my bike was groaning it had gotten so muddy the night before as I moved between the cafes. To start with it didn’t feel like the best Christmas day ever, the going was tough as the desert rolled. I had to work my way up small hill after small hill, there was also a headwind. To be frank I wasn’t really in the mood for riding in the desert, I wanted a warm hotel room and a decent meal. I thought that as a Christmas present to myself I would accept the next lift that was offered to me. I assumed someone would offer as it had happened when I wanted it the last two times in the desert. Sadly no one pulled over, that clearly only works when I am in actual distress rather than being lazy. In the end I was glad no one offered as I ended up making a good distance at the end of the day, even if it had been gruelling. 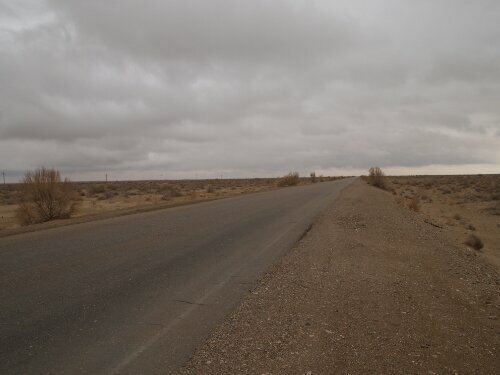 I also saw Turkmenistan in the distance as the road I was on runs quite close to it. Come the end of the day I was determined to find another cafe to sleep at. I didn’t want to spend Christmas day under canvas. At the time I had set to stop I saw buildings ahead and thought again ‘hurrah’, ‘a cafe’. Again, it wasn’t a cafe but another inconveniently positioned police checkpoint. Again they pulled me over. Thankfully this time they were more perfunctory and just asked a few questions, looked at my passport and sent me on my way. And again just past the checkpoint was a cafe! Sadly this one was basically a tarped over frame which looked to be more of a cooking area. So I asked the owner if there was somewhere to sleep up ahead – he suggested there was – 5kms ahead. It was getting dark quickly but I thought I could make 5kms and still have enough light to set up camp if there was nothing there. So I rode off hopeful of a larger cafe up ahead. No such luck, 5kms past with no sign, I decided to ride another couple to make sure. It was really getting dim now…Then another couple, there must be somewhere to sleep round here! Then after 10km I saw a building set just off the road, it clearly wasn’t a cafe or anything of that kind but I figured I’d go up, knock and ask to camp nearby – in case the police from last night were right and there were wolves. I still don’t know where the guy earlier had meant I should stop as it was 20km to the next cafe the following day. Still at this building there was a light on inside and food on the stove so I was confident my knocks would be answered – which they were. Happily I was then invited in and it turned out that the building was some sort of gas line checking station. I wasn’t quite sure how it worked but there were three guys living in there and they would get phone calls every so often and data through on some dial up internet connection that they would process. The place was very warm and the men were very kind sharing their dinner of potato and unidentified meat soup with me and generally trying to make me welcome. They said I could take the spare bed but I said the floor would be fine…the bed looked like something might have died in it. So happily Christmas evening was spent inside with some nice guys and with a warm sense of achievement from the days riding. I was also pleased as I had fixed my knees which had been giving me some pain for some time. Turned out I just needed to raise my saddle as the winter boots I was riding in have such a thick sole they meant my knees weren’t extending enough anymore. The next morning I rode off with breakfast in my belly and a sense that I could make it across this desert. This confidence gave me the energy to make really good time the next day leaving me with only 100km to make on the fourth day of riding. 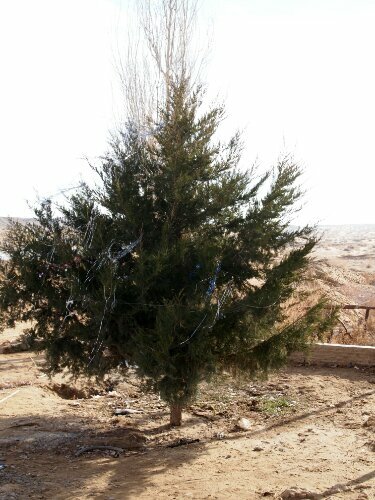 I also found a guesthouse place to spend the night, outside the only town marked in the desert: Gazli. It wasn’t the Ritz: no shower, an outside toilet that hadn’t been cleaned, probably ever but it did have a bed. The next morning I woke up excited to know that saving a serious mechanical failure or the worse headwinds imaginable I’d be spending the next night in a proper town. I powered off for a pretty boring day’s ride, broken only by a group stopping their car and pulling me over for photos and another group who pulled over and gave me some bread and a delicious homemade fruit juice. 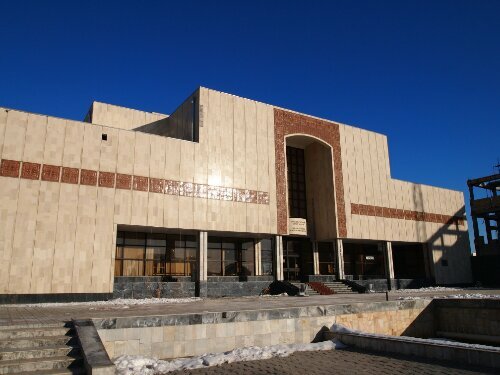 Until I got closer to Bukhara and civilisation once again reared its head. 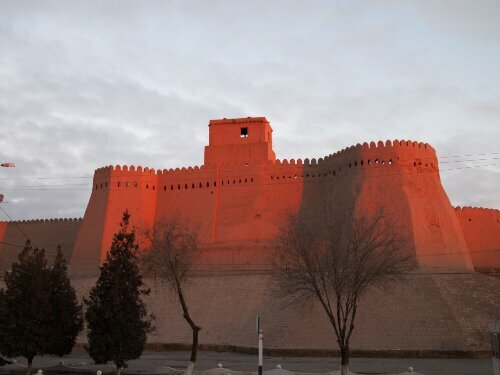 Pulling into the city I felt pretty happy – I’d managed to conquer a desert and I was even more pleased when the owner of the B&B I was staying at asked if I’d cycled from Khiva and said ‘no cheating?’ and I was able to say ‘no cheating’ this time.